If I spread mulch on top of my head, will that make my imagination better? You know, give me better ideas for art? Or do I need to inject it through my ears into my brain? I mentioned one form of mental fertilizer for ideas last week. This week I want to mention another one: photographic reference. "Oh for God's sake", you say. "I already know that. That is so obvious." Do you pull out a photograph and paint only what is in that photograph? Do you ever pull out many photographs or reproductions looking for things that will spark ideas? Do you ever look for things that you could add to or change in an existing idea? Do you ever use reference to build an entirely imaginary scene or design? Where do you get the reference you use? 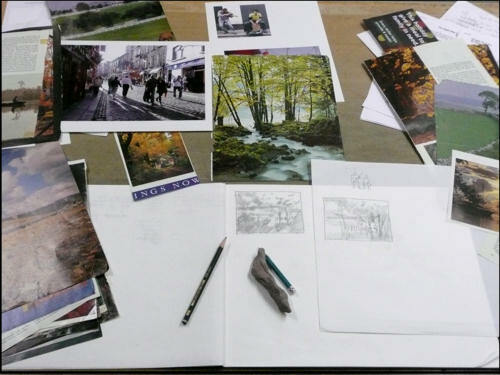 Below is how my drawing board looked as I started brainstorming ideas for a painting commission. You can see I've spread my fertilizer out around my sketch paper, because I'm beginning to search for ideas for the imagined scene I will eventually paint. Since this is the beginning stage of sketching ideas, I try to leave my mind open to any and all possibilities. Some of what you see are photographs I've taken on various travels. The rest of what you see are pictures I've pulled out of magazines over the years. National Geographic, J. Crew catalogs, Good Housekeeping, just to name a few. I tore out pictures I found interesting in some way. Things I thought might someday be useful, like different tree shapes, interesting skies, animals, vehicles, historical photos, people. In other words, fertilizer for ideas. P.S. Most of us, I'm sure, take and use our own photographs for reference. You can also find reference on the internet, if you know what you are looking for. But let me also suggest an alternative. Depending on how much you get outside with your camera you can greatly enlarge the range of your reference by harvesting interesting pictures from magazines, advertisements and catalogs that cross your path. Pictures of things that might be added to an existing idea. Pictures that might suggest ways of changing an idea, like adding a spectacular sunset or an interesting building. Pictures that might suggest a whole new idea. And begin to use this fertilizer to open your imagination to the multitude of possibilities beyond just one photograph or just one idea.